Healy Group Pty Ltd has recently been appointed Australian distributors of the Spitzlift Lightweight Portable Cranes. These unique portable cranes can weigh as little as 26 kg, while the largest model weighs only 31 kg and has a lifting capacity of 408 kg. When not in use, the crane body can be folded and stowed away in a toolbox or the rear of a vehicle, leaving tray and floor space clear. It comes with its own carry bag and can be used in multiple situations. The operator simply needs to install additional mounting points on other vehicles and work sites and the portable crane can be moved around. 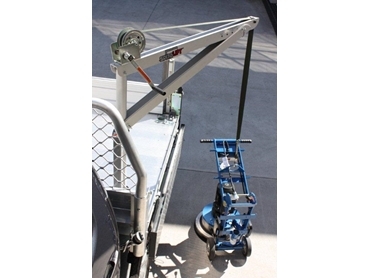 Various attachments are available for the portable crane to enable it to be used on table top utes, style sided utes, vans, trailers, boats, workshops or scaffolding. Available in manual and 12V DC versions, these portable cranes come with all mounting hardware, installation instructions. The 12V DC version comes with a quick connect wiring harness. There is a choice of mast and boom lengths to suit tight access situations like vans and enclosed service bodies as well as higher models for floor cranes.